At Nintendo’s Keynote speech today, presented by Mr. Iwata, a new Zelda title was indeed announced. It’s been almost 3 years since Twilight Princess hit the shelves, so anticipation was quickly building for a newly annouced console Zelda. 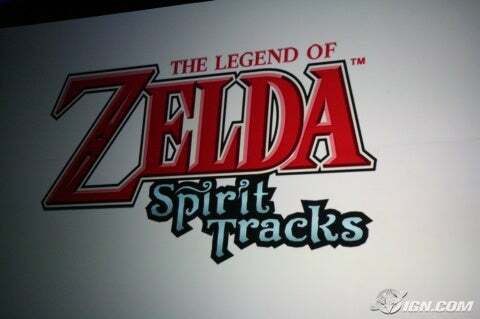 Well, Nintendo fooled us all with another Zelda DS installation – The Legend of Zelda: Spirit Tracks. Apparently, there was a short video of Link (in the PH style graphics) on a train with a canon. There was a short boss fight, and you could control a statue sidekick with your stylus. This is not really what we were expecting to hear in regards to a new Zelda project, however like that quote above showed, we were warned before this news was even revealed. Wait, you don’t belive this is true? You think I’m pulling a prank? Check out IGN’s Blog coverage. We wont have to be waiting long for this title folks: It’s apparently coming out sometime this year. Could this be a new trend? Who knows, but we are still left to ponder about the possibility of a true Wii Zelda. Lets pray it’s not delayed to launch the new console presumably in a couple years.